But speaking of chasing markets, for a practicing artist this remains of course an essential pursuit, if only to survive. It’s the other, parallel course of creative practice: economic sustainability, making money. I think this area is the most difficult to cover with simple advice, there are so many types of working environment: adult, young adult and children’s publishing, advertising, editorial and genre illustration, film design, animation, theatre, fine arts, games and other forms probably not yet invented. Most visual artists will cross over several of these, especially in a digital, multimedia environment. Therefore, versatility is paramount. That doesn’t just mean being adept at working in known styles and media, but also unknown ones – you need to be able to learn and adapt, to remain flexible, diverse, open-minded. The principle of versatility also applies to working with people, since nearly all commercial work is collaborative. Even if you are writing and illustrating a book in uninterrupted solitude, it’s still a collaboration with an editor and other publishing staff. It’s important to be reliable, and easy to work with, as much as with any other job. This is the main reason clients will continue to give you work, and almost all of my early assignments came to me through the recommendations of others. A lot of preceding illustration produced for little payment in small-press magazines and anthologies proved to be worthwhile, both as training and exposure, a demonstration of my willingness to follow a brief in a dependable and imaginative way. That’s also true of one of my very first “jobs” as a teenager, an illustration for a Writers of the Future anthology that needed to compliment a story about a time traveler who kills kittens! Communication is very important, even though so much time is spent working alone on what can otherwise seem an introverted profession. You need to be able to talk and write about everything you create in a clear and explanatory way to help others understand your ideas, especially when they are not immediately visible, especially to non-artists and certain folk who are, for all practical purposes, aesthetically blind. Not everyone is a visual artist, particularly in the wordsmith world of publishing. Empathy and patience almost always win the day, even in tough situations. You need to be open to discussion, revision and compromise, while at the same time maintaining your own artistic integrity – these are not necessarily incompatible, as so many people often believe. It’s also worth noting that publishers are right about things as often as artists are: most problems and rejections result from creative cross-purposes rather than actual disagreements. It’s important to understand each others’ philosophies and criteria. Technical competence as an artist is of course essential, and every artist MUST master this as a pre-requisite to any practice (regardless of what some art movements might suggest!). But this is only ever a tool for the realization of ideas: necessary but never sufficient. Without a strong imagination, the display of skill is just that – and “style” is interesting only if backed up by content. So much illustration looks great, but leaves little resonance in the mind; it’s brilliant in style yet thin on conceptual relevance to real life concerns. It helps to remain interested in all forms of art, and have a good grasp of art history as well as some knowledge of art theory, both past and contemporary. Understand the relationship between art and life. My own background is quite academic, and although I initially worried that studying art criticism might have been a bad choice (having no real idea what I wanted to do as a career), it’s actually been very useful. A knowledge of history and theory, and interest in art beyond making attractive pictures: this can really boost your artistic thinking. Developing a visual sensibility and vocabulary, rather than just technical skills, means that you can be perspicacious enough to deal with many different projects, and find original solutions. As long as you are doing something, even if it isn’t successful, you are not wasting your time. The greatest achievement of so much creative work is simply finding time and dedication to do it, especially when it seems difficult and less than enjoyable, particularly as almost every project seems to involve some kind of confidence-wounding crisis. in fact, I tend to measure the quality of a project by its number of creative crises. These are an important test of stamina and purpose… I actually get suspicious when things are going too well! Good ideas and talent aren’t worth much if they aren’t put through the wringer of actual hard work, worry and deliberation. Ideas are not really ideas until they are translated into labour. Failure is also an essential prerequisite for success. Pay attention to criticism, and don’t pay attention to criticism! At the end of the day, you are the ultimate judge of your own work, so learn to be critical in an affirmative rather than negative way. All creators – if they are any good – suffer from periods of disappointment, even depression with their own achievements (or lack thereof), that’s perfectly normal. It’s very important to remember this, because the belief that depression is abnormal is worse than the depression itself. Just keep going, if you want to cross that threshold. You also never find out if you’ve really failed until you actually finish a piece of work, so your goal should always be, first and foremost, to just finish things. Each success, regardless of quality, will build confidence, and confidence is the key. You also need to protect that sphere of confidence from unwelcome opinions or minor setbacks. Don’t expose yourself to inappropriate criticism. Finally, for anyone interested in being an effective artist, illustrator, designer, even a film director – you should really learn to draw well. It’s a valuable foundation, something you’ll always use, regardless of technology or genre, and especially regardless of artistic fashions. Drawing is more than just wielding a pencil with precision, it’s a way of seeing well, something that takes several thousand hours of practice, and even then, never entirely mastered. Good drawing is a timeless skill, infinitely adaptable, and will never become passé. My entire career rests on my ability to draw well, to think effectively using simple pencil marks. All other visual skills and techniques, from oil painting to CG animation, are elaborations of this fundamental skill. Being an competent artist is one thing, getting published represents a rather different set of problems. The most important advice I can offer is this: please consider the publisher. What can you offer them with your work? Research the area you are interested in, and know what a prospective editor might be looking for, what other work is out there. A picture book text might be as brilliant as it’s potential illustrator, but if it does not suit the list that a publisher is pursuing, both are quite likely be rejected. Unfortunately, publishers do not exist to supply a canvas for free artistic self-expression – I wish! – they are primarily a commercial business. Many young artists don’t pay enough attention to this important fact. Most people who do get published are very pleased, but not terribly surprised as if winning a lottery, because they’ve already done their homework and understand their surroundings. They have put themselves to some extent in an editor’s shoes. Be aware too that there is a “culture” of illustration in any genre that you need to be familiar with (which can vary from country to country). One good way of finding out about this is to study recent works that have won major awards, and think about what they have in common. Recognize trends, but don’t bend backwards to imitate them, or try to be something you’re not. Rather, look for the point of intersection between your creative interests, and the kinds of books that are being successfully published. Artists who insist they can write or draw books that are better than anything being currently published bascially do not understand the culture and need to learn more about it. 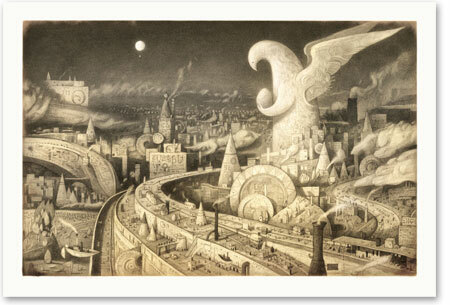 As a contemporary illustrator a lot can be accomplished by having a very good website, and a well-presented folio. I would keep both of these quite simple, showing only your best work; young artists always seem to err (as I did) on the side of excess. A good folio needs only about twelve pieces – be very selective, especially if you are presenting in person. These should represent technical skill and diversity, colour and monochrome; and especially anything featuring human figures, something editors usually look for. Where possible and appropriate, it is good to arrange a face-to-face meeting with a relevant editor or art director. I’ve personally found this very useful, to get to know each other as people rather than less memorable email or web addresses. Success as an artist, especially in publishing, has much to do with warm relationships. But don’t believe anyone who says “it’s not what you know, it’s who you know” – it’s what you know and who you know. The ‘what’ is much more important than the ‘who’. And, last of all, good luck, but don’t just wait around for it to happen, make your own! For more tips on getting published, particularly in relation to picture book submissions and useful organisations, please visit my FAQ page. love,love love his work! Thanks for posting this!!! No problem Patti!! Always good to have something to aspire to!! I had the pleasure of hearing Shaun at a Sydney event and he is a terrific and inspiring speaker. He’s so right when he says how important communication is for illustrators; to inspire publishers, children at school visits and audiences with their vision and work! Shaun is one to follow. I believe we have to inspire the readers to love to write and inspire them through good literature and great art illustrations. Wise and inspiring words, well worth reading. Your article is very inspiring with lots of hints for illustrators and artists! 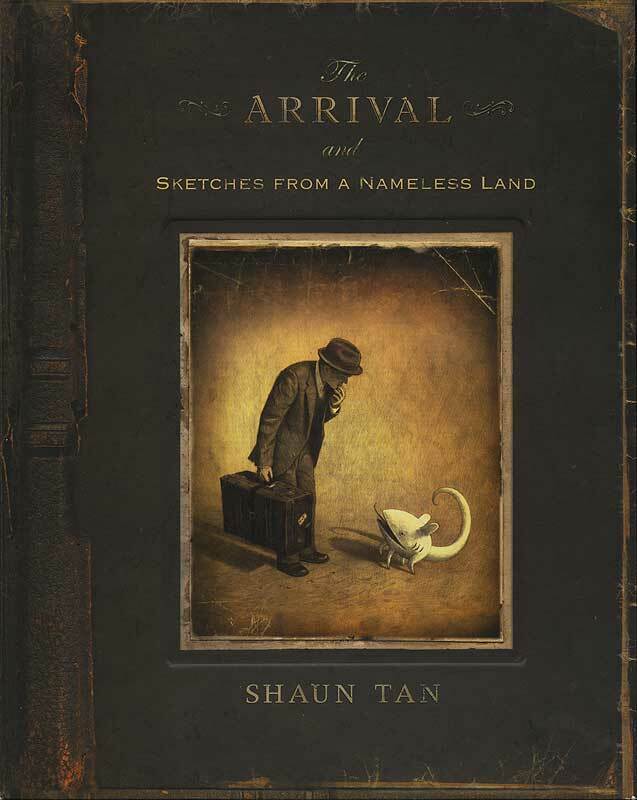 Wilson, thank you for sharing this incredibly good and kind article by Shaun Tan! You’re welcome Mark. Glad someone posted it on FB and I ran across it! Great stuff for sure! Dear Wilson, This is the best advice I have come across yet in my new venture into becoming a children’s illustrator. This is chock full of helpful info. You’re welcome Carol and bigger thanks to Shaun for his wisdom! !